Until recently, Boswell’s draft materials for his Scots dictionary were assumed to be lost. 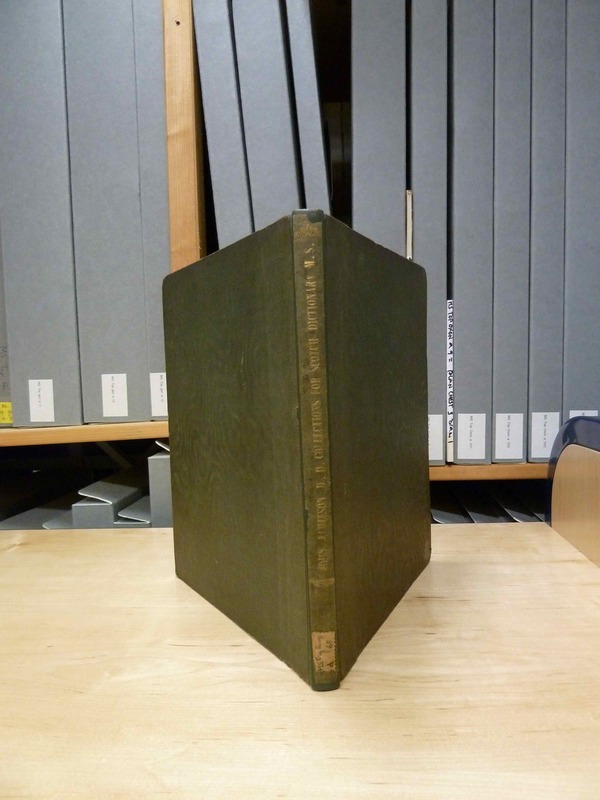 The trade editions of Boswell’s journals, published in the 1950s, noted that a Scots dictionary manuscript had been included with the sale of Boswell’s son’s library, in 1825 (see Provenance), but that its current whereabouts were unknown. In fact, far from being lost, the dictionary manuscript had been safely housed in the Bodleian Library in Oxford since 1927 – only not under Boswell’s name. When the Bodleian purchased the manuscript, it was already bound together with a Prospectus for Jamieson’s Dictionary, and was believed to be the compilation notes for the latter, in Jamieson’s own hand. Jamieson’s Dictionary was published in 1808, over forty years after Boswell began to compile his own work (see John Jamieson). 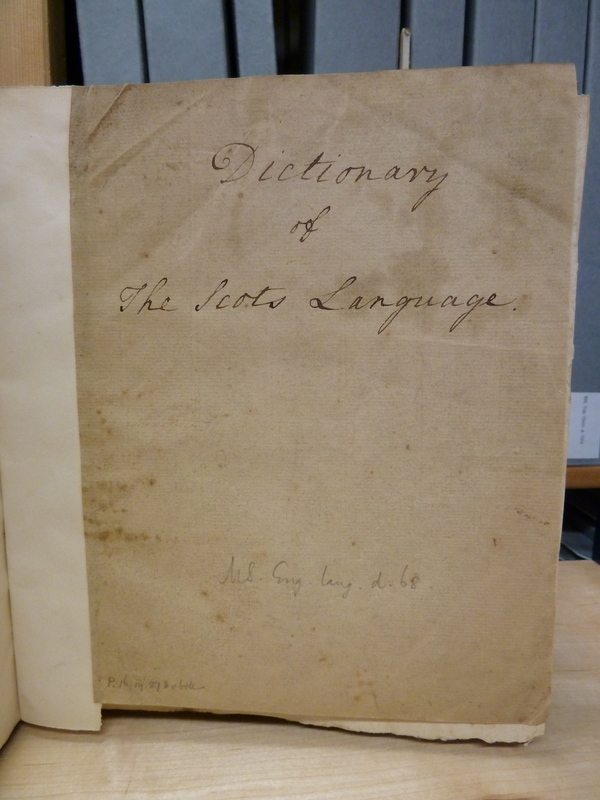 In 2008, I was in the Bodleian conducting research on John Jamieson and his Dictionary. The Bodleian holds a number of Jamieson’s letters, as well as a rare copy of his Prospectus of 1802, which I was keen to examine. It was, therefore, entirely by chance that I came across the draft dictionary materials which were bound in with Jamieson’s Prospectus. The notes were not, as I eventually realised, anything to do with Jamieson’s Dictionary, but had been misattributed to Jamieson in the 19th century. I soon came to suspect that the manuscript might be by Boswell, and might therefore be the ‘lost’ materials for his abandoned Scots dictionary, and was eventually confident enough to approach Boswell experts for confirmation of the authorship. There is no doubt that the manuscript materials are those which Boswell began to compile in Utrecht in 1764, and which he describes in his journals and memoranda (see Boswell’s Plan). Besides the handwriting, there are clues in the content which link it to this period of Boswell’s life. For example, one page of the manuscript is headed ‘Books which may assist me in my Scottish Dictionary’, neatly echoing the following description in Boswell’s journal, written during his stay in Leipzig: ‘Mr. Gotsched allowed me to search his Etymological Library, and take thence a list of such books as may assist me in compiling my Dictionary.’ (James Boswell: The Journal of his German and Swiss Travels, 1764, Research Edition, p. 147).